Okay, they're *kinda* new... I took these pictures probably 4 or 5 months ago when they *were* new and never got a chance to post them... But still... they're cool. And new-ish. You all know that Fing'rs makes my favorite nail decals. You know, the ones with the little skulls and bats? The ones I'm wearing all the time? Well, now they have even more cool designs... take a look! These are from Fing'rs EDGE... 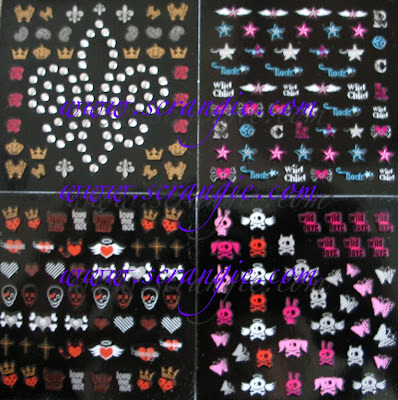 This is the Royal Punk Nail Art package. Take a look full size! We've got hearts, skulls, skulls with hearts, hearts with crowns, butterflies, nautical stars, crossbones, crowns, silver jewels. So cool. LOVE these. They go right along with my other favorites from them. The one major difference between these and the other ones with the skulls is that there's more decals in this set- four sheets as opposed to only two. BONUS! These are from Little Fing'rs and they're called Girlie Nails. I know, I know... 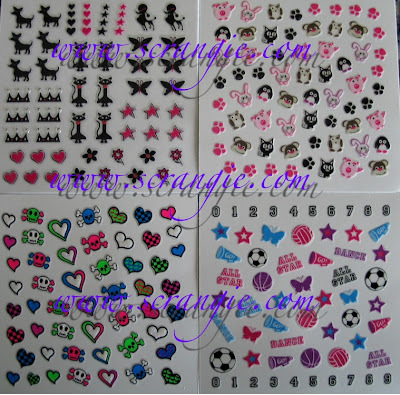 Pink package, cheerleading stickers, the word "girlie" on the front... You can't believe I bought these, can you? But I did, I totally did (I even bought a backup)! And can't you see why?! NEON SKULLS! DOGGIES!!! Doggies and kitties and bunnies and penguins and piggies and owls... Ohhhh the little paw prints... I may keel over from the cuteness. I love it so much. I'll buy anything with a doggie on it- I even used to buy that one toilet paper because it had a doggie on it. But the decals... they're awesome. I don't care if it's pink and girly, it has doggies! I love decals. I would wear them more often if I got to do 'real' manicures more often! It seems like I'm taking off my polish every 10 minutes and I don't want to waste the awesome. But every time I wear them, they're from Fing'rs EDGE. I love it that there's a brand that realizes that not every girl wants frilly frou-frou flowers. Some of us want bats! I have these and am returning them. I put them on as directed and put a top coat on, SV, and they all bubbled right up. Not worth the few bucks they were, I am curious if they do the same for you. Seriously cute! I have done decals in the past, and am now starting on Konads...I find them easier to do on my toes right now, but I am sure I will get better with practice. Thanks for sharing these - my nieces and I will be having fun with decals! I was eyeballing the rockette ones at CVS the other day and then regretted not buying them not long after. ): Man they're cute! See, THIS is why you rock! There's NO way I would have thought to look twice at the Little Fing'rs Girlie Nails decals for the same reasons you wrote! The two prime gag-enducers (for me) would have been the pink Bratz-like packaging and the "Girlie" word that makes me cringe. But DANG IT those are cuuuuute!!!... I saw the kitties and dropped my jaw. Hehehe, this is so funny because I've seen them in CVS multiple times but I always pass on them because the front sheet isn't that interesting? I am more of a rhinestones gal myself, but omg, I love those little penguins teehee. I wouldn't use the cheerleading decals but the rest are awesome. Love the first set. I definitely have to look for these. I totally want bats and poodles for my nails! I bought these too for the lil skull bunnies! I'll never use the cheerleading ones but I don't care. SKULL BUNNIES! I know I''m about a million years late commenting but I just have to say I love your taste! Your taste is near enough to my own to be incredibly useful and awesome but utterly unique and funky at the same time. Cute, fun, and darling I must say.